It’s September; the big yellow buses are everywhere. I think about education. I think about my own formal education and through conversations with co-workers and friends who have children, I think about what is considered “education” today. I have friends who “home school” their children and others who “un-school.” I do not want to go back to school to obtain another piece of paper in advanced education, but I do read and study and consider myself a lifelong student. The internet is a great tool for lifelong students. Of all the topics I’ve researched on the internet, my favorites have been economics and finance. I signed up for “Macro-Economics” when I was a student at the University of Maine at Orono, but dropped it for some unknown reason and then didn’t think about it again until 2008 when “the bottom fell out of the real estate market.” I could not understand how a bank could make money loaning money which would never be repaid. Answering that question would be a very long blog post; this is the first day back to school for some people. 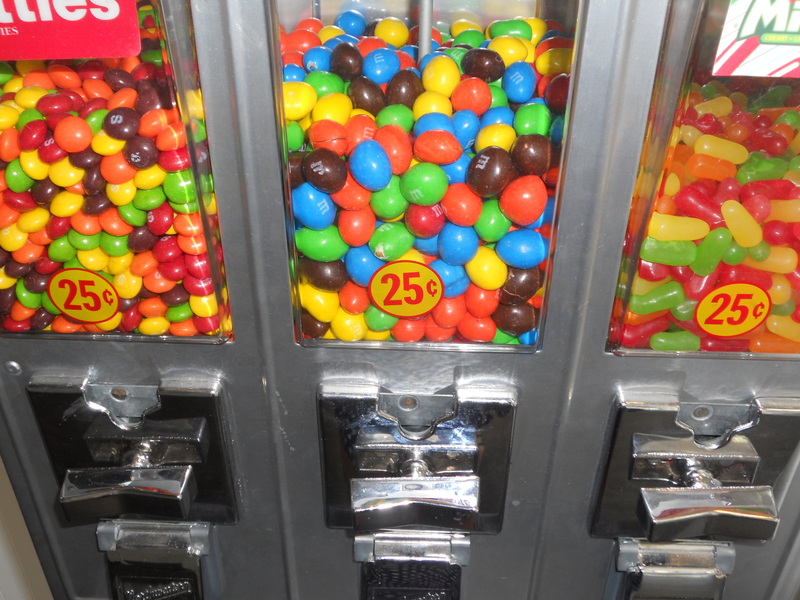 If you place a quarter in this machine, you will get 4 bits of this brand of candy. Based on the mathematical principle of zero, these candies still have some value, albeit a decreasing one since I can remember a time when a bag of at least 30 of these could be purchased for a quarter. This is math class, though, and not economics; we’ll save discussions about “value,” “production,” and “consumption” for that class when we get there. There’s the bell…see you in study hall. This entry was posted in Back to School and tagged Being a lifelong student, Economics, Mathematics, Value, Zero. Bookmark the permalink.